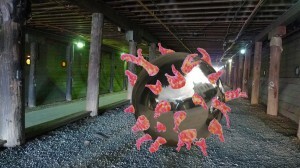 Lee Boroson will be creating a major new and unique commission for Glow under the Santa Monica Pier along the pedestrian/bikeway. Boroson’s work is characterized by fascination for natural phenomenon, from galactic fireballs to earth-bound wind and water vortexes. His project under the pier will bring the Glow audiences into a nether world, a convincing space that is inviting and somewhat unnerving, full of wonder for the world we live in. Glow 2010 will commission approximately 25 artists to create original artworks specifically for this one-night event. Artists include Céleste Boursier-Mougenot (Séte, France) , Lee Boroson (Brooklyn NY), Rafael Lozano-Hemmer (Montreal, Canada), Steve Roden (Los Angeles) and Jennifer Steinkamp (Los Angeles). In addition to these five internationally known artists, up to an additional fifteen artists will be selected through an open-call to artists in Los Angeles County. An important component of Glow’s programming includes the Glow Network, an affiliation with organizations in Los Angeles that are engaged in unusual and/or locally-based arts and culture activities.